Kalmar, part of Cargotec, has signed an agreement with Exolgan container terminal in Buenos Aires, Argentina, to supply a 4 rubber-tyred gantry cranes (RTGs) with hybrid drivelines. The order also includes the supply of a spare parts package for the machines, with the delivery scheduled for late 2019. The Exolgan is a general cargo and container-handling port terminal with strategic road, rail and river transport connections. 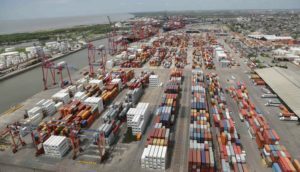 Being the leading port operator in Argentina, Exolgan S.A. handles one third of the country’s total foreign trade container volume. The company is part of ITL (International Trade Logistics), a group of businesses specialised in managing port and logistics processes. ITL is supported by its international shareholders: PSA International and Terminal Invetsment Limited, the port management branch of MSC. Exolgan terminal is located in the Dock Sud area in the south of Buenos Aires. It is the largest container facility in Argentina, with 1.1 mln TEU capacity. Its current Kalmar fleet includes RTGs, empty container handlers, forklift trucks and reachstackers. The new order forms part of Exolgan’s fleet expansion programme. Kalmar’s second-generation Hybrid RTG builds on the proven, sustainable performance of the previous-generation model and delivers even greater savings in fuel efficiency, airborne and noise emissions, and maintenance costs. It combines the latest lithium-ion (Li-ion) battery technology with a fuel-efficient diesel power unit. The power unit is used to charge the Li-ion batteries, which power all the lifting and driving operations.